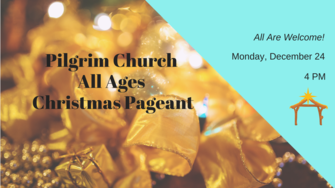 On Christmas Eve, Pilgrim Church at 55 Coolidge Avenue, Lexington, will hold its annual All Ages Christmas Pageant and Candlelighting Service. Families, friends, and guests are invited to celebrate the birth of Jesus and welcome in Christmas. Glowing luminarias will line the Pilgrim walkway. Everyone is welcome to stay for cookies and conversation following this uplifting service.